The overall quality and reliability of a product depends upon the selection of right component from right supplier. 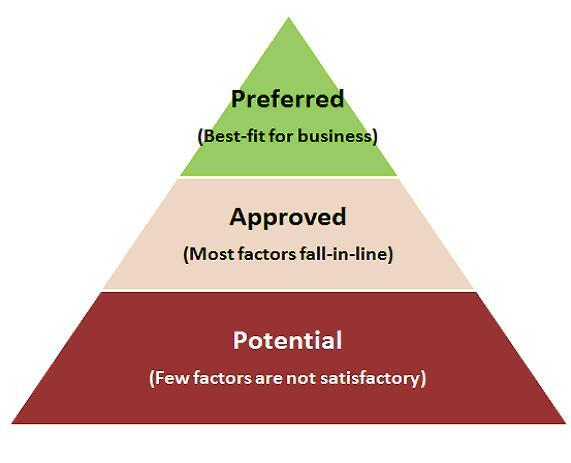 A strong and well-built process can help in selecting a prospective supplier, A stronger inter-connection between the different functions and teams is key to successul part selection. In this competitive market, the probability for the suppliers to deviate from the normal-intended procedures to capture the customers is very high. If these deviations are not thoroughly validated, there can be serious damages caused to the products, environment, life, and company's reputation in one or the other form. Suppliers need customers at any cost and hence the probability of choosing the right supplier and their qualification becomes more complex now-a-days. As said in the introductory sourcing guide, typically 60% of the finished assembly consists of components derived or purchased from the companies other than the original equipment manufacturer (OEM). With the high percentage of dependency on external suppliers The risk posed to the OEMs is also high if one does not choose a proper vendor/supplier. Hence choosing the right vendor/supplier becomes very much essential for long-term growth and sustenance. Supplier selection includes various activities such as researching the market to locate the right supplier; gathering supplier information such as their technical abilities and products, market position, customer support, etc; contracting terms and agreements; negotiating prices and financial terms; assessing the suppliers for deviations and thus helping the suppliers to perform better for mutual growth. It becomes somewhat easy to choose a supplier from the list of potential suppliers. But the hurdle is how to fetch the list of prospective suppliers who meet the required criteria. The procurement/sourcing team's skill play an important role in addressing this issue. However, for new designs or NPIs, the design engineers, with their limited knowledge on known-suppliers, are able to provide the component-supplier information for the buyers. Additional efforts are required when the OEMs adopt 'alternate-supplier' strategy - to maintain the list of other potential suppliers for the given commodity components excluding custom and single-source components. As said in the introductory sourcing guide, the supplier information should be gathered, stored and updated on a timely basis which is required, right, recent and reliable to facilitate the overall efficiency of the procurement process. Why is the second sourcing important, what is the necessity of having multiple suppliers, Do major and big companies only require the supplier database? Few examples are mentioned below that corresponds to the real-time situations faced by the engineers demanding the need for alternate sourcing and the importance of the supplier database. a. A failed component in an electronic device is not available in the market due to its obsolescence (end-of-life). The engineer has to find a suitable replacement from any other alternate manufacturer so that the electronic device is repaired. 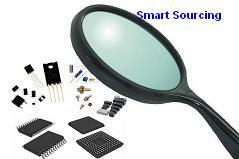 This is more relevent in high-tech components such as semiconductor ICs. b. The insufficient stock of the 'hard-to-find' component shows poor supply chain management process of a company. c. The component supplier vanishes from the business due to bankruptcy or business pressure. d. Natural calamities like the recent Japan's earthquake create scarcity of components or wafer substrates and thus the demand for such components grow abruptly. This is an opportunity for the grey market suppliers. e. Low-profit or low sale product line closures by suppliers and hence no customer-support entertained by the suppliers. f. Environmental regulations such as RoHS and their impact in their specific regions and countries can lead to the unavailability of the non-RoHS components. In the above examples, one may notice that the business is suffered ranging from purchasing the component at a higher price from the black market to the extent of production line stoppage. a. Production line stoppages, loss of revenue and loss of wages. b. Unhappy customer, damage to brand and lose out in competition. c. Budgetary limitations or unplanned budget for procuring components from open or grey markets. d. Time and efforts required to research for alternate components at the neck moment thus promote tremendous pressure on employees. e. Abrupt rise in the price of the components due to the heavy demand. f. Additional testing overheads (UL, CSA agency requirements) cause further delay in the release and the significance is even more when the alternate components have longer lead times. In order to overcome these challenges or to recover from these situations, one has to maintain a second or third sourcing list to 'be-ready' and 'compliant' against the above mentioned situations. To save the business from the unseen, sudden and uncontrollable losses due to the unavailability of components sourced from the external suppliers, second sourcing and the supplier database is very much in need for the successful supply chain operations for any organisation, big or small. Successful companies do maintain databases such as AML (Approved Masters List) or AVL (Approved Vendors List) or Sourcing database, etc., which may or may not be part of the ERPs. These AMLs or the AVLs contain the list of alternate suppliers and the corresponding orderable part numbers for each of the primary component. In case, the component is a custom or a speciality component, importance is given to stock such component in enough quantities that depends upon the estimated annual usage (EAU) and the product life (in years). Each company follow a different path to choose and classify the suppliers based on their specific requirements and supplier ratings, but the overall intention remains the same across all the companies. 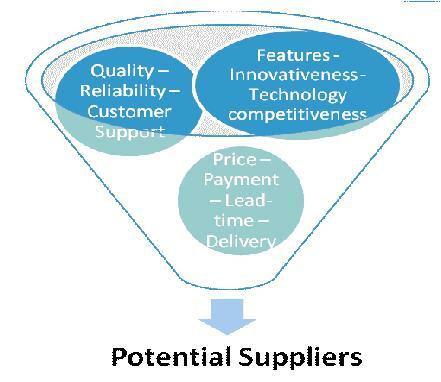 The following list of key factors helps in selecting potential suppliers. Once, the list of probable suppliers is gathered, the next step is to categorize them based on their suitability and overall credibility. One simple method to classify the suppliers is to assign appropriate rankings to each one of them based on the above mentioned individual factors and the information collected. The ratings can vary between companies based on their individual requirements. Example: The 5 key factors can be assigned a score which is based on the importance of the parameter and each supplier should then be evaluated against these 5 key factors. The final score obtained for each supplier can be considered to designate the supplier as potential, approved or preferred. The Potential Suppliers can be classified as the suppliers which do not satisfy one or more factors and hence they obtain a percentage of not more than 54%. The Approved Suppliers are the ones which satisfy most of the factors and obtain a minimum percentage of 66% and up to 80%. The Preferred Suppliers are the suppliers which are tagged as the best-fit to do the business because their overall rating at least meets a minimum of 80% and more. They are the ones which are given the highest priority at all the times and hence better productivity can be expected. Note: The ratings and the score given in the above table is just for illustrative purposes. However, the user can create a similar score card that suits the individual's requirements. 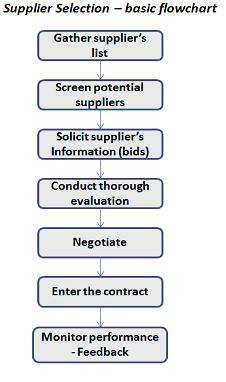 With the help of the above factors and the data, the selection of the suppliers is performed in the order as shown in the flowchart below. Using the web and other sources, a comprehensive list of probable suppliers list is formed. Screening or evaluating the suppliers based on the data (factors) available gives the list of potential suppliers. Request the information such as bid data, contract terms, support, sales history, financial reports, code of ethics, etc., to further scrutinize the supplier's validity. Price negotiations and entering into contracts will be the final step in the supplier selection process. Stronger supplier relationship and positive results can be achieved by monitoring the performance and effectively communicating. 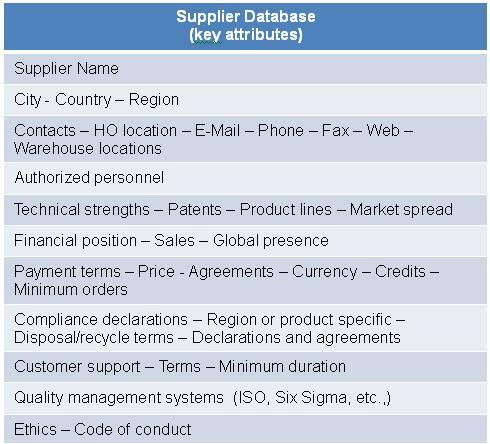 A Supplier database is a comprehensive list of suppliers and the supplier's information maintained for internal reference purposes only. The supplier information provides a ready-made guide for the supply chain, sourcing and design teams to enrich their productivity. The database at a minimum contains the supplier's name, contact details and preferred status (approved, potential, or preferred). The attributes to reside in the database are company-dependent. The engineers, preferably, selects the components and services from the preferred suppliers only as they would have already been evaluated. There are several advantages of having a Supplier database in an organisation (both, big and small sized). a. Serves as a reference database for the design engineers to select the suitable components from the distinguished suppliers and hence less efforts. b. Consolidation of suppliers can be achieved which in turn creates cost-saving opportunities. c. Highly efficient collection and validation of compliance declarations (Certificates of Conformances, RoHS certificates, Test reports, and Materials declarations) can be achieved. d. Decreases redundant inventory and the associated budget. e. Promotes productive supplier management. f. Lesser then number of suppliers in the active inventory, lower the risk anticipated. g. Speeds up the product development cycle. h. Decreases enormous time and duplicate efforts of the resources. i. Smart Inventory and parts management. j. Strengths and weakness (pros and cons) of the listed suppliers are thoroughly analysed by the Sourcing team and hence the repeated analysis efforts are eliminated. As said earlier, the supplier database is not just specific to the size or the nature of the organisation. Whoever, wants to adopt a smarter supplier selection and qualification process, can develop and maintain a supplier database. The database can be in any form such as MS-Excel spreadsheet, MS-Access, Oracle tables, and any similar database. Thus, selecting suitable suppliers and their effective maintenance is predominantly dependent on the type of the process, tools and the databases utilized in the organisation. In other words, the collective information, as highlighted in the other modules, plays the vital role in the overall success of the supplier management and in turn the business itself. 1. The effective collaboration and communication with the external suppliers is very important for any successful supplier partnership. 2. International standard procedures are available to qualify suppliers and supplier's deliveries. 3. Expectations and requirements should be clearly set with the suppliers. 4. 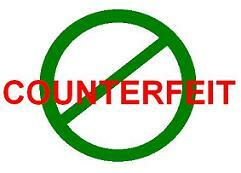 Audits on a periodic (surprise or pre-determined) basis with the suppliers promotes mutual growth. 5. Due diligence of the suppliers especially at the time of business pressures to reduce costs is required. 6. Following the market news regularly is beneficial. Part1: Smart component sourcing is about green, clean, rugged, and the $:The basics of modern component buying methodologies are explained in these series of articles.